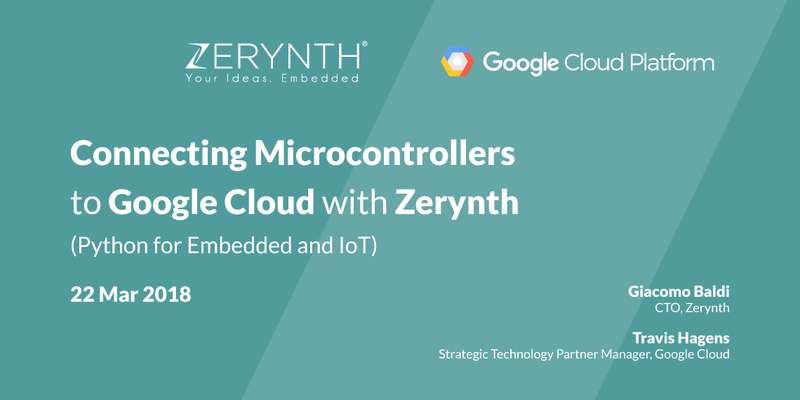 Zerynth and Google Cloud Platform are running a joint online webinar: “Connecting Microcontrollers to Google Cloud Platform with Zerynth” on Thursday 22 March 2018, 6pm (CET). Register for free clicking here. The webinar will introduce how and why to build IoT solutions in Python using Zerynth and Google Cloud IoT Core. Zerynth, the Middleware for IoT, is a software toolkit that allows programming in Python or hybrid C/Python the most popular 32-bit microcontrollers, and connect them to the leading Cloud Infrastructures. how to use Python to easily exchange data between an Espressif ESP32 board powered by Zerynth and Google Cloud IoT Core. Can’t wait to see Zerynth and Google Cloud IoT Core in action? Take a look at this sneak peek. You can see a how to exchange data between 4zerobox, a board based on ESP32 for Industrial IoT Solution providers, and Google Cloud IoT Core using MQTT.